In the last chapter you learned how to construct business ratios and conduct activity analysis. In this chapter we show you how to use the ratios in real world situations. We first use them to analyze the performance of Amazon.com over time. Then, we use them for a comparative analysis of Wal-Mart and Target. In each case, you will see how the interpretation depends on the company’s business model and strategy. To appreciate the importance of financial statements in understanding performance, consider the stock price history of Amazon.com. The stock price was $2.40 on July 1, 1997, rose to $86.03 on April 1, 1999, and was at $89.06 in November of 1999, but then started to fall. In January 2000, it was $64.56. On February 1, 2001, it was at $10.19 and fell further to $5.97 by September of 2001. Then started a slow and fairly steady increase through 2008, and was followed by very strong gains though June 2011. On June 1, 2011, the stock price was $191.63. Amazon’s performance in the first decade of the 21st century has been impressive, especially considering that the stock market (as measured by the S&P 500 Index) lost 7.67% between January 2000 and June 2011. 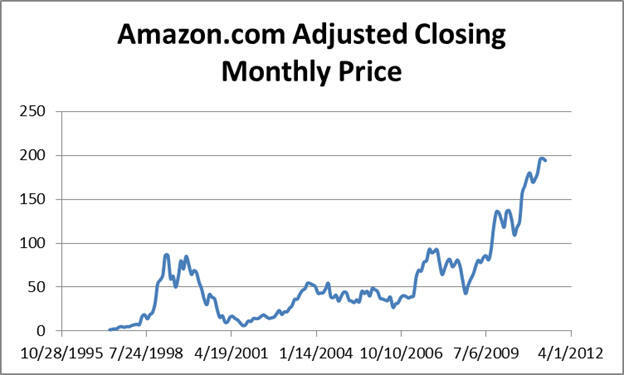 The price history also shows that Amazon lost over 90% of its shareholder value in 2000-2001and then recovered very strongly. We will analyze Amazon’s performance in two ways. First, we will look at the business ratios over time. Then, we will look at how Amazon changed its business strategy and how this was reflected in both the ratios and the stock price. As background, we will refer to an article in a Fortune Magazine dated December 18, 2000 by Katrina Brooker. The article describes Amazon’s focus on growth (“GBF or “Get Big Fast”) and an obsession with customer satisfaction. It will be useful to keep this in mind as we take you through the analysis. A much more detailed account of the early history of Amazon.com is in the book “Amazon.Com: Get Big Fast” by Robert Spector (April 2000). It contains fascinating details about the growth of the company and the evolution of its strategy over time, particularly at the end of the 1990’s.